The Cumberland River flooded downtown and many other parts of Nashville in May 2010. But people got busy and helped their neighbors, and the city recovered more quickly than many places would have. For two long days, the rain kept coming and coming and coming. By the time it stopped, more than 13.5 inches had fallen on Nashville in 36 hours – a staggering amount of water that still can be difficult to comprehend. The flood of May 2010 hit every part of our city. Eleven people died, and 10,000 were forced out of their homes. Emergency responders performed more than 600 water rescues. Nearly 11,000 properties were destroyed or damaged without regard to cost or prominence. The toll was devastating. Homes and businesses were lost. One of Metro’s two water treatment plants was submerged. Schermerhorn Symphony Center, which was less than four years old, and the Grand Ole Opry House, home to so much music history, sustained heavy damage. Soundcheck, a rehearsal and storage facility where Brad Paisley, Keith Urban, Lorrie Morgan, Vince Gill and many other musicians kept guitars, wardrobes and other gear, was underwater. Gaylord Opryland Resort & Convention Center had to evacuate 2,000 guests that Sunday night and then shut down indefinitely for extensive renovations. The list went on and on. The total countywide cost was estimated at more than $2 billion. But the people of Nashville responded beautifully, rolling up their sleeves – and pant legs – to help the victims dig out. Neighbors helped neighbors, strangers helped strangers and the government did what government is supposed to do: serve the people through assertive action, mobilization of resources and constant communication. Hundreds of thousands of selfless acts and volunteer hours helped people get back on their feet, sometimes faster than anyone could have expected. “Every single person was affected. It wasn’t somebody else’s problem,” says Ellen Lehman, president of The Community Foundation of Middle Tennessee. “Everybody themselves had water, or their neighbor did, or their relative did. The music industry, our greatest claim to fame, stepped up to raise money for flood relief efforts. Garth Brooks, who had not been performing much in recent years, played nine sold-out concerts at Bridgestone Arena, raising $5 million for The Community Foundation’s River Fund. Vince Gill, Alison Krauss, Keith Urban, Naomi Judd and other country stars pitched in to host what Gill called “an old-school telethon” on WSMV Channel 4 a few nights after the flooding stopped. The three-hour broadcast raised more than $1.7 million. Nearly six years later, Gill said the community’s response to the flood reminded him of the “we’ll just fix it” attitude he used to see in Oklahoma, where he grew up. 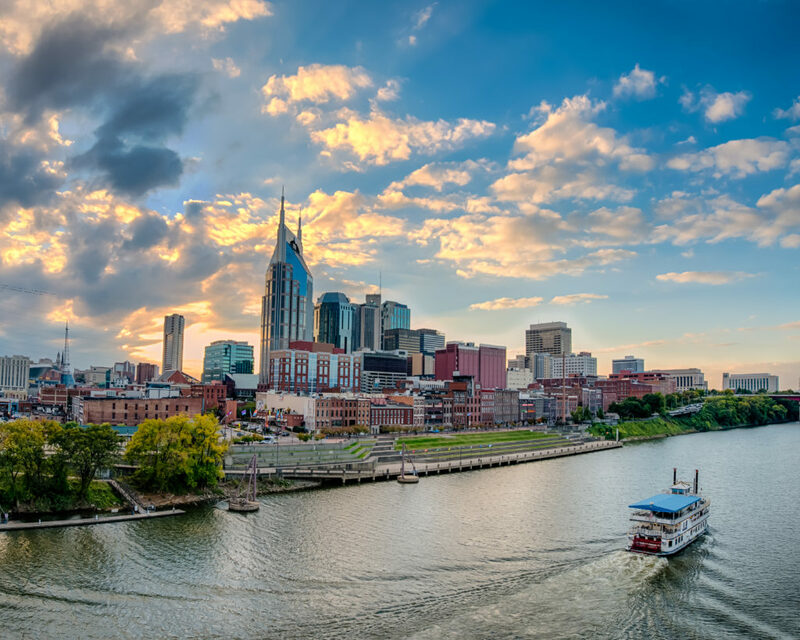 By January 2013, The New York Times was calling Nashville the nation’s new “it” city. “Flush with young new residents and alive with immigrants, tourists and music, the city made its way to the top of all kinds of lists in 2012,” the Times told its international audience. The city is still growing rapidly, and business is booming. Longtime developer and investor Bert Mathews says he’s never seen the Nashville real estate market this hot. Bridgestone Americas, for example, is getting ready to open its new, $232 million headquarters south of Broadway and add 600 jobs to the 1,100 that are already based in the city. Nashville’s tourism industry is doing better than ever, accounting for one-third of the visitor spending in the entire state. The primetime drama “Nashville,” which has moved to the CMT network after four seasons on ABC, has been broadcasting Music City’s appeal around the world and pumping millions of dollars into our economy, both directly and indirectly, since 2012. The 2,886-room Gaylord Opryland Resort & Convention Center, which had to shut down for six months after the flood, is the most successful convention hotel in the United States outside of Las Vegas. Opryland had its best year ever in 2015 and expects to top it in 2016, says Colin Reed, chairman and CEO of Ryman Hospitality Properties. While many other cities might have been set back for years by such a disaster, Nashville came out ahead in the end. We showed that we can handle anything. We demonstrated that helping people get through tough times and back into a position to succeed is what we do best. And we proved once again that the citizens of Nashville, working to realize a brighter future, can do incredible things together.